The 2019 harvest is expected to start at the end of April. Please don’t order yet! Please check back for more news, if you are on my mailing list I will update you. The ordering system allows you to send to someone else, and to add a message. 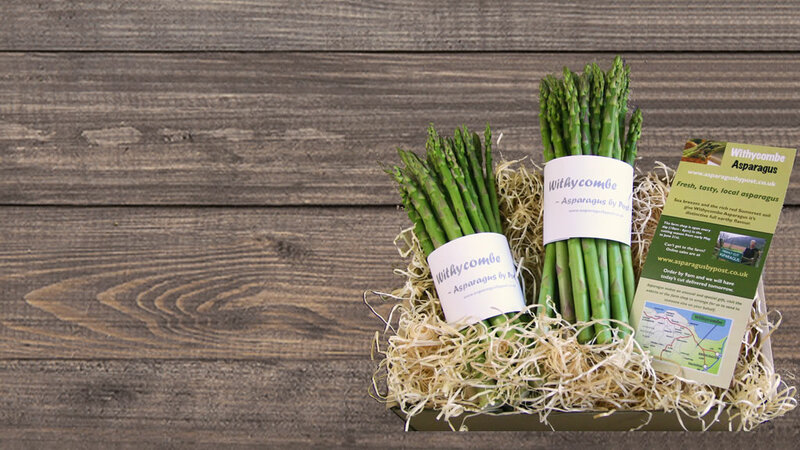 Order here for next day delivery or visit the farm shop which is open every day in the season. Orders of 4 bundles (or fewer) go by First Class Post and can be delivered Tuesday to Saturdays nationwide. 5 to 8 bundles have to go by next day carrier and they don’t deliver on a Saturday or Sunday, or to the Highlands and Islands. Please fill in a contact form, and I can include you on the email list to let you know when the next season will start. Normally the season runs from early May to mid June but depends on the weather. Please call 01984 640236 to leave an order for collection. We harvest every day during the growing season. We then wash and sort, trimming the woody bits off. We take care to ensure spears will arrive in the best possible condition. Order on Sat/Sun and we will dispatch on Mon, to arrive with you on Tues.
5 to 8 bundles: These heavier parcels go by Courier but they don’t deliver on Saturdays or to the Highlands and Islands. The 2019 season is nearly with us, fingers crossed we should start at the end of April.